Nathan MacKinnon, credit: Ron Chenoy, USA TODAY Sports. 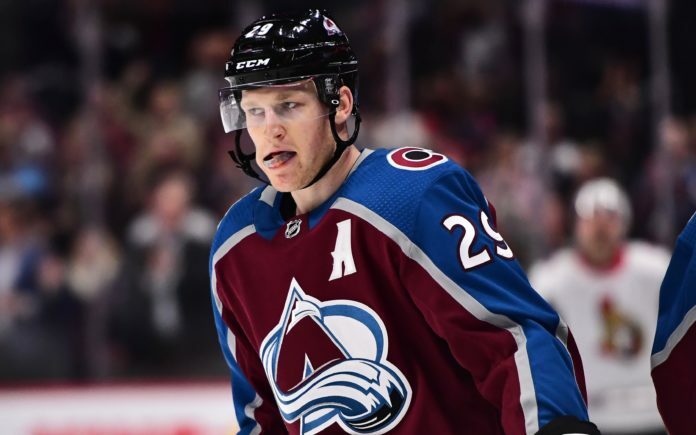 Kyle Keefe recently joined Eric Goodman and Les Shapiro on the Afternoon Drive to discuss Colorado’s success this season and break down what makes the duo of Mikko Rantanen and Nathan MacKinnon so special. The Avs’ top line has been able to generate quite a following this season, as the two Avalanche superstars currently sit atop the NHL point leaders. Rantanen sits on top of the table with 47 points, with MacKinnon right behind him at 43 points. Naturally, with any type of success people will be able to gain attention from fellow and former NHL players — this is no different as Dallas Stars Hall of Famer Mike Modano has become quite fond of the two superstars. 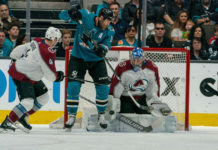 Behind a line that is built up from blistering speed and brute strength, the Avs top line has been able to take over games seemingly at will — something that hockey fans in Colorado remember back from the “Golden Years” where the Avalanche brought home the Stanley Cup in 1996 and 2001 with hall of fame forwards Joe Sakic and Peter Forsberg. Although there are some doubters of the Avs top line success, there is one thing to keep in mind — this success is not just based off of this season, it goes all the way back to last season as well. Coming to the end of his entry-level contract season after this season, it will be interesting to see the paycheck that Rantanen will receive following this season when Avalanche GM Joe Sakic signs him to a brand new contract. With the success the Avalanche have had with the play from MacKinnon, Sakic has received an absolute bargain as MacKinnon’s contract runs until 2023 and tops off at 6.5 million dollars. Taking a look at some of the other top players in the league, Keefe is on to something. Taking a look at the point leaders this season will speak volumes, as some of the best players in the world trail the Avs top superstars in the points race this season. 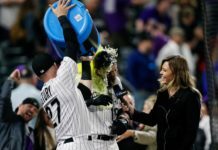 Although the top line has certainly been leading the charge, one area of the Avs game that everyone seems to be overlooking is the overall depth that runs throughout this team — and it all begins with the goaltenders. Coming off a 5-2 victory over the Florida Panthers last night, Avalanche goaltender Philipp Grubauer improves to an impressive 7-0-2 record in his past nine games. Along with the success from Grubauer, Avalanche goaltender Semyon Varlamov holds a strong 10-6-0 record on the season. One major concern surrounding the Avalanche heading into this season was where the secondary scoring would come from behind the powerhouse top line. Over the past few games this season, especially the game against the Panthers last night with a two-goal night performance from Avalanche veteran forward Carl Soderberg, secondary scoring is evident for the Avs. 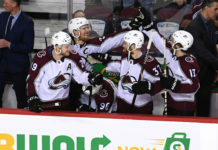 With a top line that continues to be dominant this season, a GM that has not only planned for the present but has also planned for the future, and has secondary scoring that continues to improve as the season continues, the Avalanche seem to be all set to be at the top of the NHL standings for years to come — with a high possibility of the Stanley Cup returning to Denver sooner rather than later.